Hello there! 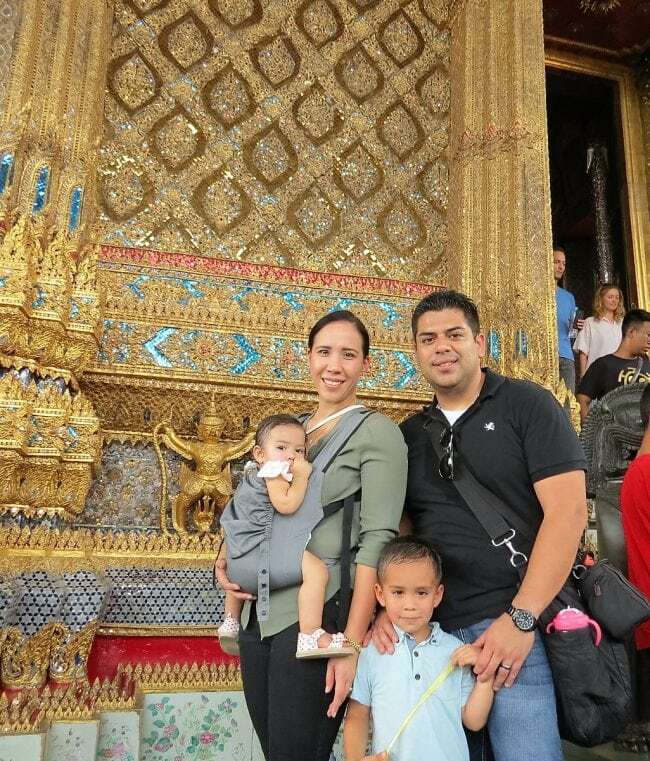 I took a hiatus from blogging for our 2 week Family Trip to Thailand. If you follow me on Instagram or FaceBook you got to see some of our pictures and updates while in Thailand. We’ve been home for almost 2 weeks now, but right when we got back, we all came down with a stomach flu and the entire week was spent recovering. Now we’re feeling back to normal and just happy to be home! I missed cooking and can’t wait to get our meal plan started for the week and go grocery shopping. Yes, I missed grocery shopping too! I wanted to share some pictures and what we did on our trip. This trip was 5 years in the making, Danny and I got married in 2011 and planned on going to Thailand the following year, but I was pregnant, so we put it on hold. Then each year after that it didn’t seem to work out, but finally 6 months ago we decided to just plan it and hope for the best! We traveled on EVA Air from Los Angeles to Bangkok with a layover in Taipei. Our tickets were priced well, and we got a discounted rate for our 3 year old son, and only paid taxes for an infant lap ticket. EVA Air was very accommodating and excellent customer service. On the way to Bangkok they gave us an extra seat for the baby, score! And on our return flight we got bulkhead seating for the bassinet attachment. We left LAX at midnight and that worked out really well since both kids ended up sleeping the majority of the 13 hour flight to Taipei. We arrived in Bangkok just before Noon the following day. Then we took a flight from BKK to Krabi, on Bangkok Airways. This was a short 1 hour flight to the beach town and we took a taxi to our hotel at Krabi Resort. The resort is located right one the ocean and consisted of cute little bungalows and mini condos. The resort had a security guard in the front, private beach area, nice pool, and a good restaurant. We stayed here for 3 nights and it was the perfect way to relax from all our flights. We asked one of the hotel taxi drivers where there was a nice restaurant with good seafood, and he took us to Krabi Seafood Restaurant. This place did not disappoint, it was probably one of our favorite restaurants on our whole trip! 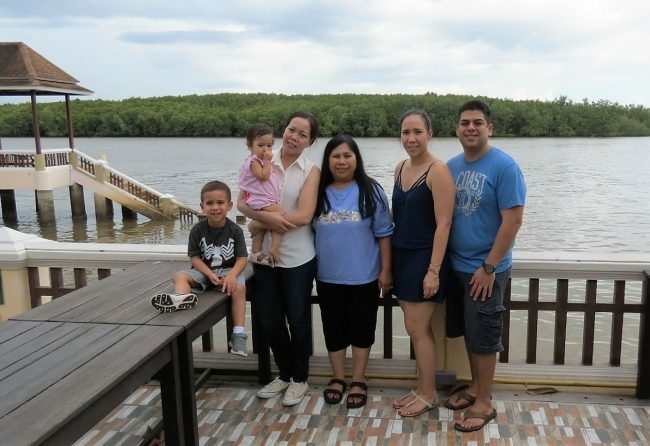 The restaurant sits right on the water and the seafood was fresh and the food was very authentic. 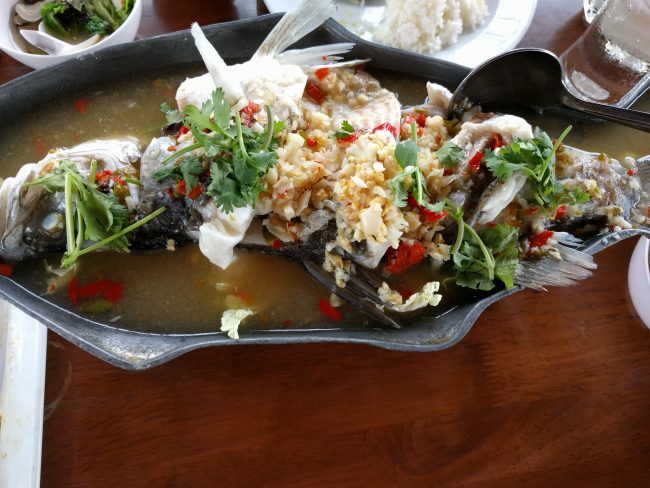 My favorite was the whole fish steamed in lime juice, garlic and chili’s, Pla Neung Manoa. Our last day in Krabi we took a boat out to Poda Island. 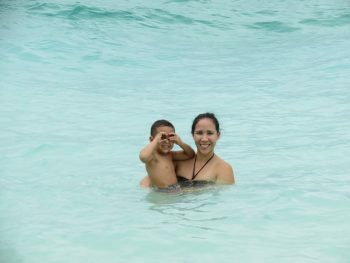 The hotel offered an all day excursion to see 4 different islands, but since my toddler went with us, we decided to just do a 4 hour island trip. The water was crystal blue and we went for a nice swim in the ocean. You can see my son was loving it! 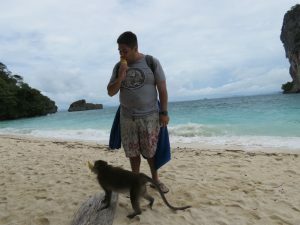 We also saw some wild monkeys on the island. Danny was eating a corn and it jumped on him for a piece! We couldn’t believe it! Some of the locals on the island told us to give it to the monkey otherwise he could get feisty and we didn’t want that to happen! 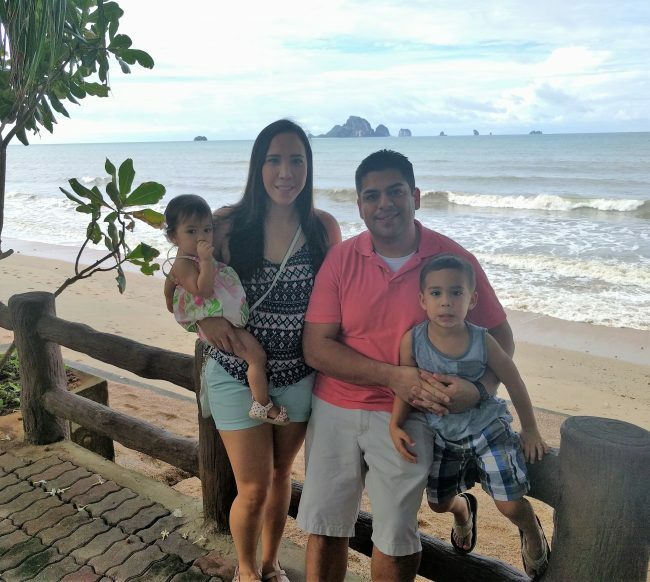 If you travel to Krabi or Phuket, I highly recommend doing the island tours. Our next leg of the trip consisted of visiting with family and taking a road trip up North. My grandmother lives in a small farming town about 30 miles out side of Bangkok, called Samphran. Since there are few hotels in that area, we stayed in a larger town about 15 minutes away, called Nakhon Pathom. Here we found a nice hotel through Trip Advisor, The Proud Exclusive. The hotel was clean, modern, and only about $30 USD a night. We stayed here for a week and spent our days with family and roaming the night markets in the evening. 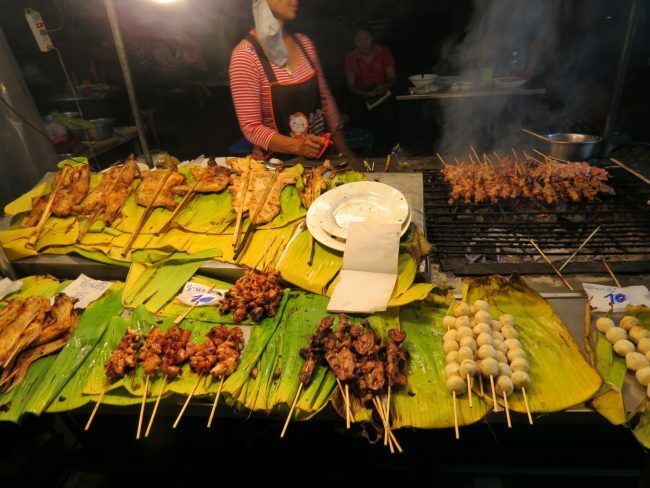 We had some good street food at the night market in Nakhon Pathom. 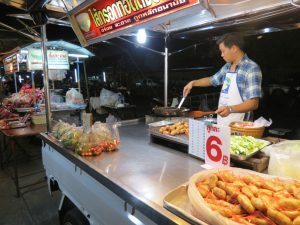 Some favorites were Chicken and Pork Satay, and Shrimp Pad Thai. 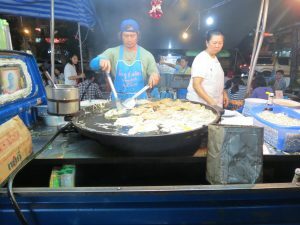 The guy with the huge wok is making Fried Oyster Omelette. 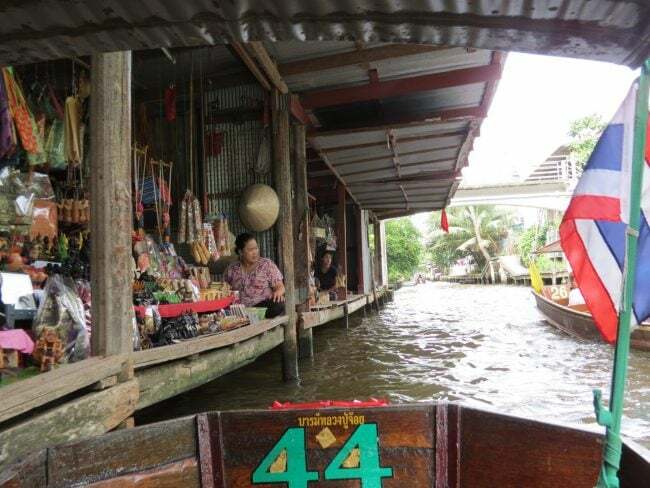 Another popular attraction in Thailand is the floating markets. We spent the day at one and enjoyed purchasing souvenirs and food all inside a boat. We also spent a day in Bangkok at the Royal Palace and Wat Pra Kaew. This was just a week before the King of Thailand passed away. The day we left was when news broke on the King’s death. Since then there have been city-wide mornings of his death and remembrance of his reign over Thailand. My kids are not wet, that just sweat lol! Living in the desert with no humidity made it hard to adjust the 100% humidity in Thailand, but they were such troopers and did so well on the entire trip. I’m so thankful that we were able to make this trip possible and visit my mom’s family. We had an awesome time and the chaos of traveling with kids, was definitely worth it. If your planning on taking a trip to Thailand and want to save some money, then I would recommend going during the rainy season (Aug-Oct). Granted it will rain almost every day, but it usually clears up after an hour of rain. The beach towns and resorts typically have discounted rooms and there are less crowds during this time. Otherwise if you prefer to travel when its not so wet, then I would recommend going in April when it’s Thai New Year. There’s lots of fun water activities and so much to do during this time of year. Feel free to leave any questions in the comments, I would love to answer them. That is awesome! So glad you had a fun time. The ocean looks like a pool since it’s so blue!! Now I want to visit there .